Arsenal recovered from an early Mido strike to stun Wigan with four second-half goals and collect an away win. Mido volleyed in a deserved opener in a lively first-half display but Theo Walcott equalised on the hour after good work by Andrey Arshavin. Mikael Silvestre converted a pass from Cesc Fabregas and Arshavin punished a shocking error by Jason Koumas. Alexandre Song rounded things off for the Gunners by dancing through the defence to stroke home the fourth. But the result was extremely harsh on a Wigan side whose defensive effort and all-round industry enabled them to more than match Arsenal's artistry for much of the game. And boss Steve Bruce will also be unhappy after seeing Arsenal defender Kieran Gibbs escape with a yellow card after he hauled down Antonio Valencia when clean through on goal. The game started tamely enough with early long-range efforts from teenager Gibbs and Fabregas, but goalkeeper Lukasz Fabianski - making his first league start of the season - was at fault as Wigan went in front thanks to some Mido acrobatics. Ben Watson's inswinging corner had Fabianski flapping and after a towering header from Emmerson Boyce, Bacary Sagna only half-cleared the ball to Mido, who reacted brilliantly to crash the ball home. 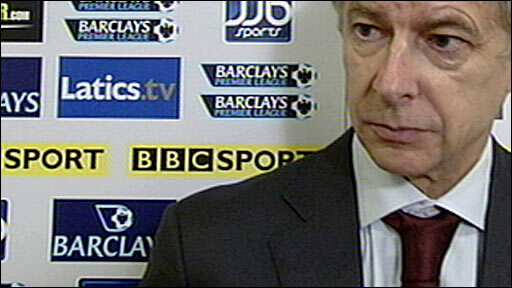 With Wigan continuing to press forward, the frown on the prowling Arsene Wenger grew deeper as he watched defender Johan Djourou limping off to be replaced by Silvestre. In the final seconds of the first half, Watson curled a free-kick onto the post, but the decision that led to the kick left the Wigan players incensed as they walked off at the interval. With Valencia clean through, Gibbs wrestled the midfielder down and it appeared that only the nearby presence of Silvestre discouraged referee Alan Wiley from pulling out the red card. Mido had to be substituted after 58 minutes following a collision with Fabianski and Arsenal were level only seconds later. With the ball caught between Arshavin's legs, the Russian somehow managed to hook the ball through to Walcott who crashed the ball into the top corner of the net for his first goal since October. The game then turned on its head as Fabregas threaded the ball through to substitute Silvestre from the left and the French defender side-footed in from the six-yard line. Wigan's defence wilted and Arsenal made it three when Arshavin poked the ball into the far corner after the careless Koumas played it straight to him. And worse was to come for the home fans in the final minute as Song breached a static defence to complete Wigan's misery. "The disappointing thing for me was the second and third goals. It was comical stuff really. We have gifted Arsenal goals after a great hour when we worked so hard to deny Arsenal space. "We are a bit shell-shocked. It would be difficult to say it was schoolboy stuff as that would be disrespectful to schoolboys." "I feel we have shown great character again. This young team has a lot of mental strength. We have shown some qualities that make it very interesting for the future. 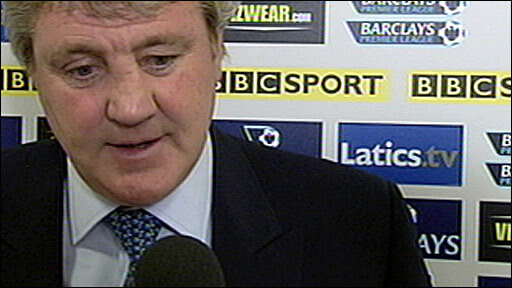 "Wigan were very strong and committed in the first-half. We had problems with their man-to-man marking. But I felt in the second-half our technique took over. We looked dangerous every time we had the ball." Subs Not Used: Pollitt, Kingson, Sibierski, Edman. Arsenal: Fabianski, Sagna, Toure, Djourou (Silvestre 35), Gibbs, Walcott (Adebayor 68), Denilson (Van Persie 63), Song Billong, Arshavin, Fabregas, Bendtner. Subs Not Used: Szczesny, Nasri, Vela, Eboue. Booked: Gibbs, Van Persie, Song Billong. Goals: Walcott 61, Silvestre 71, Song Billong 90, Arshavin 90. BBC Sport Player Rater man of the match: Arsenal's Andrey Arshavin on 8.13 (on 90 minutes).